Simple clothes to remind you of home: Bring your favorite t-shirt, or that pair of underwear that you just can’t imagine being without. Because as easy as it is to buy simple clothes when you’re abroad, you’ll want things to remind you of home and it might as well be something you have to bring regardless. Nylon laundry bag: You’ll be doing laundry while you’re abroad and depending upon your accommodation, you might have to walk to the laundromat. Bring a nylon laundry bag with a drawstring so that you can easily keep your dirty clothes from making a mess of your room. Don’t get a see-through one; pick a solid color (preferably not one too outlandish) because you never know: you might have to walk a block or two with it in public to the nearest laundry. I use one similar to this one on Amazon (just $2.80). Hipster tote bag(s): At the rate these are given out at events, festivals, etc, these are practically disposable. But they come in handy when you’re in a new city. Bring a few different ones for your different looks. They’re useful for carrying your books or laptop to a nearby cafe (hopefully with free wifi). Plus you’ll want them for groceries because, well, just about every grocery store around the world these days charges for paper/plastic bags. If you want the full-on hipster look, try the über-trendy hipster tote bag from Berlin-based The Hipstery. At least two pairs of shoes. Because. Really, how could you get by with less? And for those of you that use jogging or running as a way to chill-out and relax, bring your running shoes. You won’t regret it! Don’t give up your usual routines just because you’re abroad. Something simple but formal: I always have a skinny tie or two with me. They’re small and don’t take up much room in my luggage but can turn even a casual outfit into something a bit more elegant. I’ve recently been traipsing around the world with a pair of suspenders. For me, these are essentially the male equivalent of a little black dress. The Kindle. Full stop. Okay, seriously. I love printed books and all that, but if you’re going away for a semester I can’t recommend enough bringing a Kindle with you. I’ve got my Kindle Paperwhite with me and I’ve already bought two books on it while I’ve been away for just three weeks. Even though I have a TV and an internet connection in my room, there’d just be something odd about binging on TV sitcoms while abroad. All my available free time is usually spent outside drinking and meeting people; the rest of my time reading in bed before I fall asleep. A decent pair of headphones: I’ve got my basic earbud headphones which I use pretty regularly, but you never know how noisy your neighbors might be when you’re staying in student housing — so bring some quality headphones to help block out the noise! Amazon.com regularly has special deals. Point-and-shoot camera: As a student traveler studying abroad, you’ll want a simple point-and-shoot camera to take with you on nights out. I’ve just received a new Olympus Stylus TG-2 (retail value $379) which seems tough and sturdy: it works underwater, is drop-resistant and can withstand semi-extreme temperatures. TOUGH! Though if you’re semi-serious about photography, also bring a digital SLR camera. I travel with my Canon T3i (retail value $500). A journal: Actually, I’d only recommend brining a travel diary or journal with you if you regularly keep one at home. If you don’t, then I still think you should keep a journal (written, even—not just a blog! ); I just think you should actually buy the journal wherever you’re studying. Find a local stationery shop and pick something out while you’re there. Then the memories will be stronger. TRAVEL TIP: Hey students! 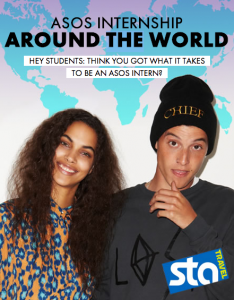 ASOS (that fairly hip fashion label from the UK) is currently running a scholarship and internship competition. The prize? Six weeks of all-expenses paid travel around the world this summer! The selected winner gets to visit London, Berlin, Shanghai, Sydney, New York and Lille, France visiting ASOS offices PLUS $3,000 to spend on your holiday (and $1,000 to spend on ASOS.com!). Enter the super-cool contest before March 3, 2014. 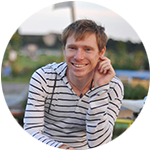 The contest just requires students to submit a “life resume” — a more creative version of a boring resume. EASY. Enter now and, if you win, be sure to say hi when you come by Berlin! The tours and travel are arranged by STA Travel—a discount student travel agency I’ve used on previous trips when studying abroad. Great post. I like the formal part because I think most of the time I might have a decent jumper but no tie to make a shirt look that step or two classier. Yep – having even just a small accessory to add a bit of style to your outfit is sometimes all you need. Hello Adam, this is a great post! Thank you for sharing. I especially like the “something simple but formal”. One time I was caught not having something formal to wear to an event I found out about on the spot. Another item I would recommend is a portable external hard drive. It’s great to save a backup copy of your passport, certificates, reference letters etc when you are studying abroad. It comes in handy when you need to apply for bank accounts, a rental place, a part-time job, etc. Also in the very unfortunate case if your laptop gets stolen… it’s good to have a backup. Oh definitely yes, Mzuri – that is an essential item when I travel! Also another tip: if you back up your photos to a zip/pen/USB drive, I keep a small locked text file on it that says something like “IF LOST PLEASE RETURN TO” which then includes my contact information. It’s sort of like a digital bag tag, if you will. I did that after I left behind a small 2GB USB drive with my photo backup in an internet cafe. I realized that even if someone found it, they wouldn’t have any idea how to find its owner! Thanks for these tips! I never thought about the journal. What a a great idea! Seems everyone loves the journal idea, Cynthia. Glad you found my tips helpful! Yep – I was always kind of keen on journaling and it always just made sense to buy one out there. Great advice, Adam. Generally, we’re not so methodic when it comes to packing as you. Clearly, we need to learn a great deal. The beauty of packing is everyone has their own way – and yet I think it’s still incredibly common to almost always forget to bring your toothbrush! I don’t know how many toothbrushes I’ve had to buy on holiday…. !